Ahead of a light week for economic data releases, investor focus has turned to Asia and the U.S. president's visit to the region. Trump has already brought up trade grievances about both China and Japan and has warned the region nations against challenging the U.S. After Japan, Trump flies to South Korea and China later in the week. Two more central banks are meeting this coming week – the Reserve Bank of Australia (Nov. 6 10:30 pm EDT) and Reserve Bank of New Zealand (Nov. 8 3 pm EDT). Neither is expected to change policy. In Europe, composite PMI's will be posted in Europe, beginning with today's German September manufacturing orders and industrial production. Industrial production for France, Italy and the U.K are also expected this week. In Asia, China begins to release its latest monthly data for merchandise trade and consumer and producer price indexes for October. Elsewhere, Brexit talks will resume amid a lack of progress in talks over the U.K.'s exit from the E.U. In Japan, the Nikkei share average ended flat overnight as weakness in financials was offset by gains in retailing. The index ended almost unchanged after printing its highest intraday level in 21-years. Last week, the Nikkei rallied +2.4%, its eighth consecutive weekly gain. That was its longest winning streak since PM Abe's Abenomics reforms started five years ago. 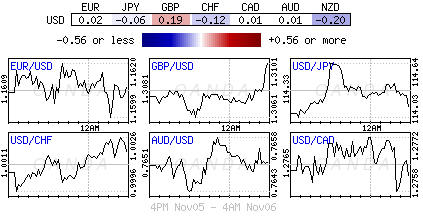 The broader Topix edged down -0.1%. Down-under, Australia's S&P/ASX 200 Index dipped -0.2% and South Korea's Kospi index lost -0.9%. In Hong Kong, stocks pared sharp losses overnight, as mainland investors sought bargains in blue chip stocks. The benchmark Hang Seng index tumbled as much as -1.6%, but recouped most of its losses by market close, ending down -0.6%. The China Enterprises Index lost -0.7%. Note: The weakness was the result of profit taking triggered by negative news flows over the weekend – including a corruption crackdown in Saudi Arabia and a call for tougher regulation in China. In China, stocks ended higher, supported by gains in consumer and healthcare firms. The blue-chip CSI300 index rose +0.7%, while the Shanghai Composite Index closed up +0.5%. In Europe, regional bourses trade slightly lower across the board consolidating recent gains, as the Spanish Ibex once again under performs. Oil prices hit their highest levels since July 2015 overnight as markets tightened, while Saudi Arabia's crown prince tightened his power over the weekend through an anti-corruption crackdown that included high-profile arrests. This morning, Brent futures traded as high as +$62.90 per barrel, that is over +40% higher from last June's 2017 lows. 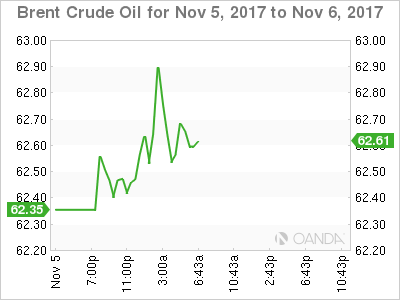 U.S West Texas Intermediate (WTI) crude has rallied above +$56 per barrel. It's one-third higher than its 2017 lows. Saudi Crown Prince Mohammed bin Salman has tightened his grip on power through an anti-corruption purge by arresting royals, ministers and investors. In the short term, no immediate change is expected in the oil policy of Saudi Arabia, which is the world's biggest exporter of crude oil. The Prince seems strongly committed to anchoring the OPEC agreement deep into 2018. Elsewhere, there are ongoing signs of tightening market conditions. In the U.S, energy companies cut eight oilrigs last week, to 729, in the biggest reduction since May 2016. While there seems to be growing consensus amongst OPEC members to extend their pledge to hold back about -1.8m bpd beyond next March's deadline. 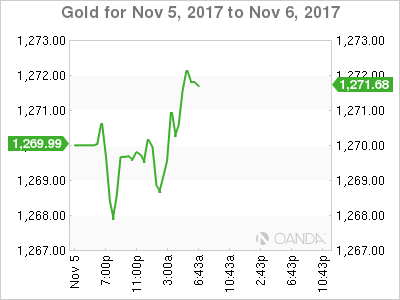 Ahead of the U.S open, gold prices trade atop of their one-week low hit in last Friday's session, as the dollar firmed after largely upbeat U.S economic data reinforced the prospects of another rate hike by the Fed in December. Spot gold is down -0.1% at +$1,268.61 per ounce. It's rumoured that Federal Reserve Bank of New York President William Dudley is close to announcing his retirement. If so, his early departure would mean the top three positions at the Fed changing over within a relatively short period. President Trump announced last week that Fed Governor Jerome Powell would be nominated to replace Janet Yellen when her term expires in February. Note: Vice-Chairman Stanley Fischer retired in mid-October. Spreads for Saudi Arabia's international bonds widened slightly in early trade in response to the government's anti-corruption crackdown, which has detained dozens of people from the kingdom's political and business elites. The yield on U.S 10-years has fallen-1 bps to +2.32%, the lowest in more than two weeks. In Germany, the 10-year Bund yield fell -2 bps to +0.34%, the lowest in eight weeks, while in the U.K, the 10-year Gilt yield declined – 2bps to +1.245%, the lowest in more than seven weeks. The USD is holding onto its recent gains against the major pairs as the markets believe, that despite the softer-than-expected jobs data on Friday, there is little change in market expectations for the Fed to raise interest rates next month for a third time this year. 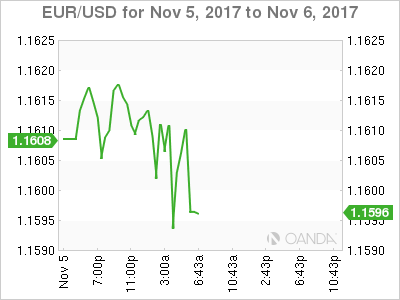 The EUR (€1.1607) is trading flat after having dropped to a one-week low at €1.1596, and against the pound at €0.8875. USD/JPY (¥114.02) managed to print an eight-month high just under ¥114.75 on news of Saudi Arabia anti-corruption crackdown. 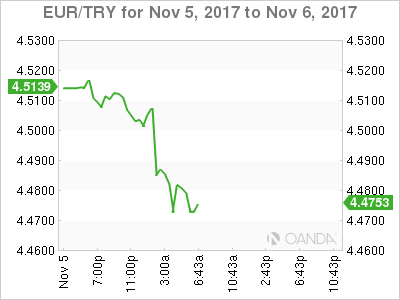 Elsewhere this morning, Turkey's central bank (CBRT) took steps to support price and financial stability, after TRY's ($3.8561 -0.53%) recent slump. In a statement on its website, the CBRT, said it has tweaked its reserve option mechanism, lowering the upper limit for the FX maintenance facility to +55% from +60% – their aim is to draw liquidity from the market and support the currency. German data this morning points to a resilient growth pace in their economy. Manufacturing new orders increased by +1.0% on the month in September, beating market expectations of a -1.3% decline. Digging deeper, orders in August were also revised upward to show growth of +4.1% after an originally reported +3.6% rise. Foreign orders rose +1.7%, while domestic orders slid +0.1%. Foreign orders from within the eurozone grew by +6.3%. Other Euro data showed that PMI services data mostly came in below expectations – miss: Italy, France, Germany and the beat were the Eurozone.